Item #2074 Sasanian, Shapur I, AD 240-270, AE Unit (8-chalkoi) , Gobl SN I/1, similar to Sellwood type #13, UNIQUE LARGEST SASANIAN COIN recorded!!! HIGHLY COLLECTIBLE!! Size: 31 X 27 mm. Obverse: bust of the king right. 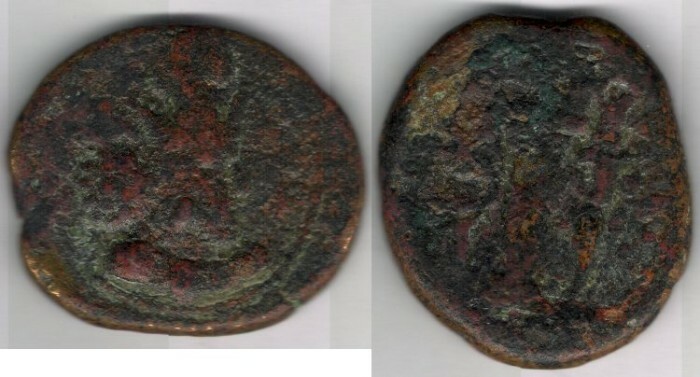 Reverse: with the usual Sasanian reverse, fire alter with attendants on either sides. Notes: Please note the grade of this coin is good very-fine and it is one of the finest pieces I have seen in copper! !